The Kong Air Squeaker Dumbbell is the ultimate toy for your dog! 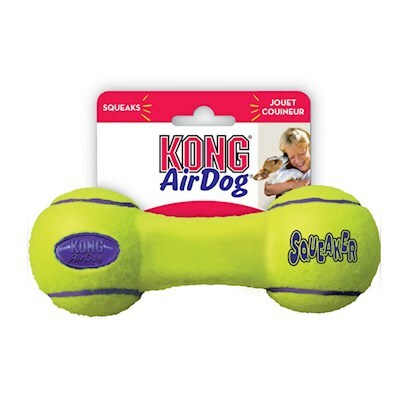 Kong brought together two of your dog's favorite toys, tennis balls and squeaker toys, and created the ideal toy for you and your pet. This toy was tailor made for games of fetch and the dumbbell shape makes the toy bounce in unpredictable directions that will keep your dog chasing it for hours! This toy also conceals an irresistible squeaker inside and even floats, so it's a great toy to bring to the beach or pool. It is constructed of special non-abrasive tennis ball fabric that will not wear down your dog's teeth. No harmful side effects. Always supervise when the pet is playing with this toy.